You know your friend is a food blogger when your birthday cake has a slice cut out of it, or so my friend Greg discovered when we celebrated his birthday a few weeks ago! 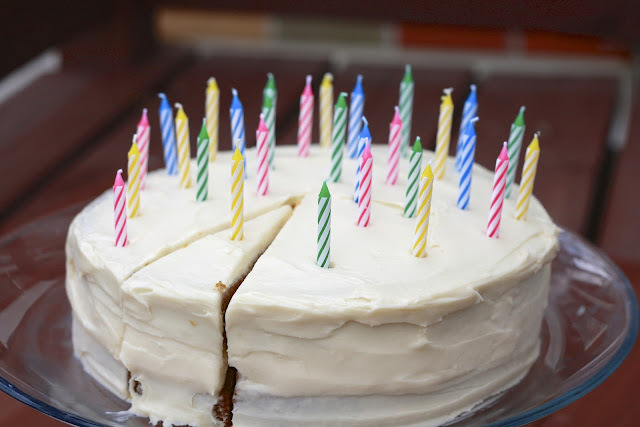 We hosted his surprise party at our house and I was adamant that I make the birthday cake—I’m always looking for an excuse to try a new layer cake. As soon as I received word from his wife that Greg was okay with pumpkin, I knew that was the flavor I wanted. 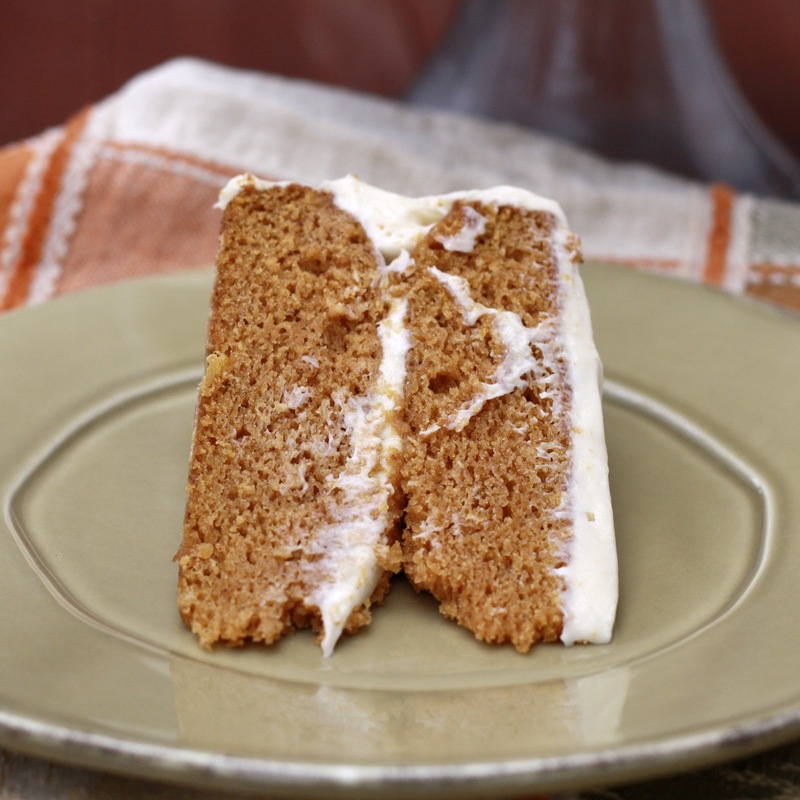 This blog is full of pumpkin desserts, but none of them are layer cakes. After searching the perfect pumpkin layer cake, I finally settled on this brown butter cake from Fine Cooking. The original recipe includes a fancy topping of nuts and pepitas in a maple glaze, but I decided to keep it simple and leave plenty of space for the (cough) thirty candles we topped it with. Next time I make it, and there will be a next time, I won’t change a thing—anything atop the cake would have overpowered the other flavors happening. 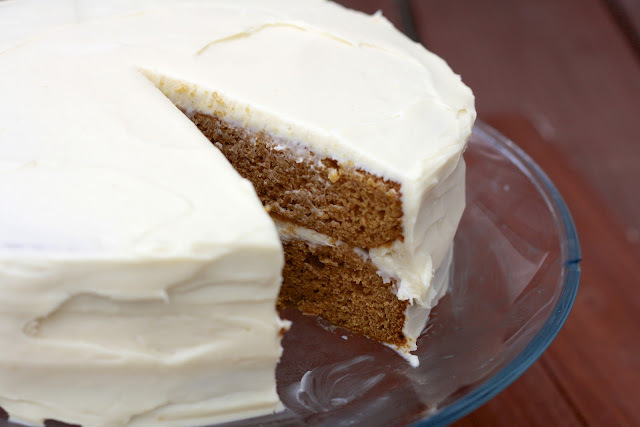 From now on I think I want all cream cheese frosting to include browned butter! One partygoer, a two year old, went straight for the good stuff, removing every inch of frosting from her piece. Clearly she understands the allure of browned butter! 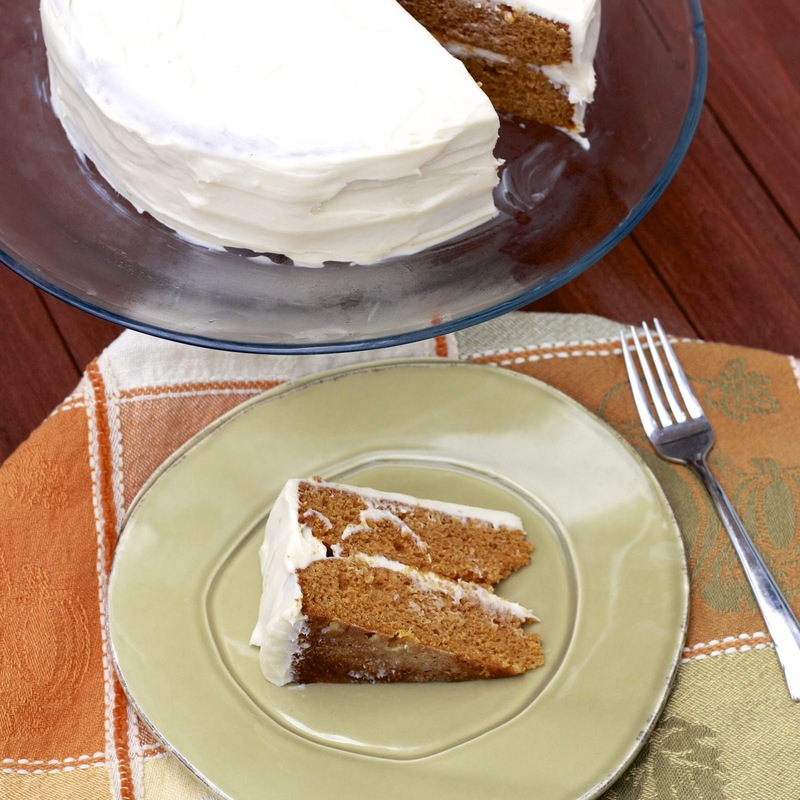 The cake was just as perfect—turning those with pumpkin ambivalence into official fans. This might be a new autumn tradition, although I’m not sure I can wait another year before having it again. While I am a huge proponent of pie on Thanksgiving, I’d give this cake a major endorsement for inclusion in your dessert spread that day! On another note...How else do you know your friend is a food blogger? When she tries to get you to wear a tshirt with her blog name on it! It's true...WhoopTee contacted me a few weeks ago and offered to design a Sweets Life tshirt. The design is simple (recognize it?) and I love it! WhoopTee was super easy to work with and after finalizing the design, my shirt was here in days. Three of you can win your very own Sweets Life tshirt (in your choice of color!). My fingers are crossed that my mom and sisters aren't the only three who enter...I suppose if you DON'T want a Sweets Life shirt you can always go to WhoopTee and design your own (they're even doing a contest now until election day that includes designing a political tshirt for a chance to win $175! As of this morning they only had one entry so your odds are good!). Check them out on Twitter or Facebook! For those of you who don't win, you'll soon have the option to purchase Sweets Life shirts. More info to come in the near future! To enter, leave a comment with a great meal you've cooked lately. I am LOW on inspiration in the kitchen lately and I'm hoping you all can help! I'll accept comments through Monday at 9 PM Central--winners announced on Tuesday! 1. Position a rack in the center of the oven and heat the oven to 350F. Line two 9-inch pans with parchment paper and butter and flour the parchment paper. 2. Melt the butter in a one-quart saucepan over medium heat. Cook, swirling the pan occasionally, until butter is nutty and browned (about 4 minutes). Pour butter into a small bowl and set aside to cool but not set (15 minutes). 3. In a medium bowl, whisk together the flour, baking soda, cinnamon, ginger, salt, and cloves. In a large bowl, beat the pumpkin puree with the granulated sugar, brown sugar, eggs, and buttermilk until well blended. Use a spatula to stir in the dry ingredients, just until combined. Whisk in the brown butter until completely mixed in. Divide the batter evenly among the two prepared pans. 4. Bake the cakes for 25-30 minutes, until an inserted toothpick comes out clean. Allow the cakes to cool for 10 minutes in the pan before turning the cakes out onto racks to cool completely (note--once cooled, I stuck mine in the freezer for about an hour so that they were easier to frost). 5. To make the frosting, melt the butter in a one-quart saucepan over medium heat. Cook, swirling the pan occasionally, until butter is nutty and browned (about 4 minutes). Transfer to a small bowl and allow to stand for 5 minutes, until the solids begin to settle at the bottom of the bowl. Place the bowl in the freezer to chill until firm (18 minutes). With a spoon, scrape the butter from the bowl (leave the solids in the bowl) and place in a mixing bowl. 6. Beat the brown butter with the cream cheese and brown sugar on medium-high speed until the brown sugar has dissolved and the mixture is a very color (about 2 minutes). Gradually add the confectioners' sugar and beat until fluffy, 1-2 minutes. 7. To assemble the cake, place a cake layer on a serving dish. Top with a 1/2 cup of frosting and spread frosting over the layer. Top with second layer and use the remaining frosting to frost the top and sides of the cake.